A research trial at the University of California Oakville Experimental Station is using colored shade nets to study the effects of light and temperature on grape berry chemistry and phenolic composition during ripening. Oakville, Calif.—Researchers from the University of California, Davis, began a trial this year at the Oakville Experimental Station in Napa Valley to evaluate the use of different colors of commercially available shade netting and its effects on grape cluster temperature and light exposure in relation to chemical and phenolic development and composition in grape berries. The trial is being conducted by viticulture extension specialist Dr. Kaan Kurtural and enology extension specialist Dr. Anita Oberholster (both of UC Davis). The researchers discussed the trial during a recent field day held at the Oakville Station vineyard. One reason for interest in the use of shade netting is climate change. “As the climate is getting warmer, we’re seeing potentially different responses from plants to temperature and light,” Kurtural said. He also noted interest in better understanding chemical changes in grape berries during ripening to potentially better manage fruit quality for its contribution to wine astringency, color and flavor. Oberholster, who participated in a vineyard shade trial in South Africa, said such trials are studying the effects of temperature and light quality and quantity and their interaction and impacts on grape phenolics during ripening. She explained some of the basic changes currently known to occur in berry chemistry during grape development and ripening. From berry set to véraison, there are increases in organic acids, amino acids, minerals, methoxypyrazines, hydroxycinnamic acids, and tannins. From véraison to harvest there are increases in anthocyanins, flavonols, sugars, monoterpenoids and norisoprenoids, and there are decreases in organic acids and methoxypyrazines. It is also known that different types of emitted sunlight exist in a range of wavelengths, and different types of light exposure and light exclusion may affect grape berry chemistry. A large percentage of sunlight at ground level is visible light, with wavelengths in the range of 400 to 800 nanometers (nm). Ultraviolet (UV) radiation from the sun is defined broadly as having wavelengths ranging from 10 to 400 nm. The majority of UV radiation that reaches the earth’s surface is UV-A (or long wave radiation that is not absorbed by the ozone layer) in the range of 315 to 400 nm. A smaller fraction of medium-wave radiation (UV-B) in the range of 280-315 nm reaches the earth’s surface, but most is absorbed by the ozone layer. The ozone layer and earth’s atmosphere almost entirely block the shorter wavelength UV-C radiation below the UV-B range (below 280 nm). The South African study indicated that both light quantity and quality impact flavonol biosynthesis. Specifically, grapes receiving the most UV-B light had the most flavonol biosynthesis. In contrast, treatments with UV-B suppression had the lowest flavonol biosynthesis. Oberholster said, “Other studies have also shown the same thing. Flavonols form in the grape skins to protect against UV-B light.” Flavonols are known to be important co-factors that influence color extraction and stability. In the South African study, seasonal conditions appeared to have a larger impact than the shading treatment on grape seed and skin tannin content. In addition, anthocyanin accumulation was largely affected by the season and not the shade treatment. 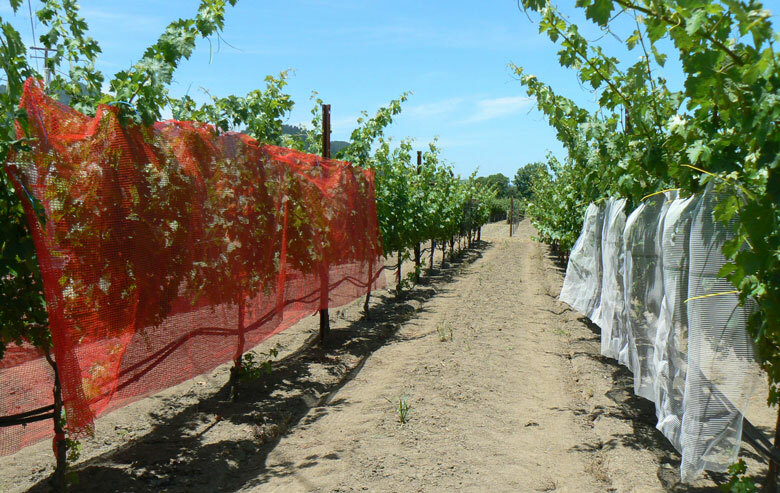 The Oakville vineyard study is using colored shade nets, known as ChromatiNets, available from Ginegar Plastic Products Ltd., based in Israel, with a California sales office in Santa Maria. ChromatiNets are also available from Green-Tek West, in Dinuba, Calif. These shade nets can diffuse light, potentially filter different parts of the light spectrum or filter light by wavelength, based on the color and density of each net. Available net colors are black, grey, pearl (white), red, blue and yellow. The Oakville trial is in a block of Cabernet Sauvignon planted in 2012 with five replicate trials with shade netting on both sides of the vine row shading clusters on three adjacent vines for each replicate. The netting was applied this spring at berry set, a period when some chemical compounds start to synthesize, according to Kurtural. The netting simply is attached near the top of the grape canopy and hangs down on each side of the vine row to shade the cluster zone. Net colors being used in the Oakville trial are pearl, black, red, blue and grey. Measurements are being taken during the growing season for each shading treatment and control vines for temperature, relative humidity, and light intensity, including photosynthetically active radiation (PAR), in the grape cluster zone. Berry samples will be analyzed at véraison and harvest from vines with each type of netting treatment along with berries from control vines to compare chemical and phenolic differences. Oberholster will be making wine from the different grape shading treatments for both chemical and sensory analysis. Physical data will also be collected and compared on berry and cluster sizes and weights, overall yields and vine pruning weights after harvest. Elazar Gal, an agronomist with Ginegar based in Israel, noted that colored shade nets have been used with different types of crops, particularly in desert environments, and they are being successfully used by commercial table grape growers in Israel, Brazil, Mexico and in the Coachella Valley in Southern California. In some locations, pearl colored nets induce early maturation, allowing product to go to market earlier and improving berry size and quality. Gal said a Coachella Valley table grape grower has used the pearl netting for 10 years and achieved a significant increase in yields for an early season grape variety that is the grower’s first variety on the market each year. Gal also explained, “In general, red netting increases plant growth with larger stems, branches and leaves in vegetable crops and in table grapes, and can be used for delayed fruit maturation.” Black netting can be used to reduce light intensity in more extreme weather and environmental conditions to prevent plant and crop damage. The net material has about a five-year lifespan, before the material undergoes UV degradation. The material is available in different levels of mesh density that provide a range of shading percentages from about 20% to 80% shade. Depending on the net type and how it’s placed over the crop, it can also provide protection from hail, sunburn, wind and birds. In most commercial crop applications, the netting is part of a structure, or net house, that covers the entire crop block. I am in Southern California and just lost a whole crop of Durif to the sun. I wonder if this works to protect the fruit and where I can buy a small variety to test the nets.